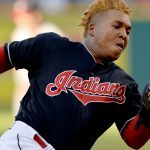 Does Freddy Peralta have upside? In one game, Peralta eliminated that question. Given any definition of upside, the heights attained by Peralta last weekend are unreachable unless one has it. Whether or not he maintains dominance for now or into the future is a separate question; he proved he can reach levels few others can achieve. Namely, striking out 13 of 21 batters against 2 walks, in a start, at Coors Field. Freddy Peralta is a one-pitch pitcher with bad command. Also, that one pitch is a fastball with mediocre velocity. What’s the relationship between stuff and upside? In order to answer that: Is pitching itself reducible to stuff? Is it reducible to stuff plus command? If pitcher effectiveness were reducible to stuff, Freddy Peralta would make no sense. Adding “command” to stuff, Freddy Peralta would make even less sense. Is it reducible to stuff, plus command, plus deception? Well… it seems reasonable to consider whether that’s even a genuine question. The basic operative theory is that pitching is reducible to stuff. Except, command (the ability to make your stuff do what you want to, where you want it to) is the remaining gap between stuff and explaining pitching success. It’s also one with a dubious definition, like “upside”, but just as Peralta clearly meets whatever defensible definition of upside one may take on, it’s equally obvious he fails to meet any definition of “command” for which one would argue. So, if he’s not bringing “stuff” or “command” to the table… how good must this deception be, versus what anyone else is managing to achieve, in order to explain his apparent upside/ability to dominate? Is it really possible he’s so singularly unique among pitchers in this respect, such that he doesn’t really need “stuff” or “command” yet can still not only pitch, but dominate? Also, is this not clearly a “God of the gaps” argument? In which we attribute what we can’t explain to the presumed force we can also least explain or define? “Command” has served a similar role as a modifier or limiter of “stuff” in explaining pitching success (or lack thereof). But Peralta has blown through that paradigm. So now primarily what remains is deception, apparently. It would similarly be a mistake to attempt to claim Peralta isn’t deceptive. That’s not the claim we’re making. Is not all of pitching deception? Sounds boring. Sorry! It might be. But what seems more likely to produce a reliable understanding of how good Freddy Peralta is, when compared to the next 1000 pitchers one wishes to evaluate? We opened with something which could be seen as a bit disingenuous. Is Freddy a one-pitch pitcher? Well, some are suggesting he really throws two different fastballs, so describing it as a single pitch may not apply in the way “fastball” does for many others. Then again, other pitchers throw a four and two-seam, and mix their speeds. So maybe this description remains fair and apt after all. Or, maybe Peralta’s fastballs are sufficiently different from one another, and indeed this is the primary source of his apparent magic; this repertoire we call limited is in fact exactly the value of it, and therefore the minute variability brought on by the different fastballs is in fact the main feature, not a bug or limitation in the summary manner it’s been described. But this actually restates the whole point of the above, re: deception, from an entirely different angle. Even the buckets which seem inarguable, and concretely/eminently quantifiable, such as those we call “velocity” and “movement”…. are themselves constructs, and incomplete, discrete definitions meant to encompass something we think we care about. As is “fastball” of course. But there can and will be cases where the descriptions baselined towards those standards (“does his pitch have good velocity, good movement?”) aren’t helpful or meaningful in the way that they are for majority of those being evaluated (concretely: “good” for the movement/velo of any given pitch probably a contingent value, not a universal one, and depends on innumerable other factors, rather than one or two). Rephrased: these sub-descriptions, like velocity, or command, are just attempts to define segments of the sequence of pitching (run prevention). And these segments never assemble together in exactly in the same way, or certainly with the same value, pitcher-to-pitcher. You know this. We all know this. But in modern pitching analysis, for some reason, we often operate as if we don’t. And again, we’re talking here about just velo and movement. Which we can actually capture, and study, and to compare when changes take place. What happens when someone’s deception gets 4% worse? How would we even know when it does? How are we defining deception, anyway? How about sequencing? Command? Intelligence? It doesn’t seem to make sense to think of pitching in this way. And Freddy Peralta’s single career game to this point seems to place the finger on exactly why it does not. Does Freddy Peralta have good velocity? Not really, but nothing that appears to be terribly limiting. Does Freddy Peralta have good movement? Nothing special, but kind of variable on the FB, perhaps such that it’s a disruptive force. Does Freddy Peralta have a good curveball? By velo and movement, entirely “blah”. But it might for some reason be perfect for him, given the challenges his fastball presents. 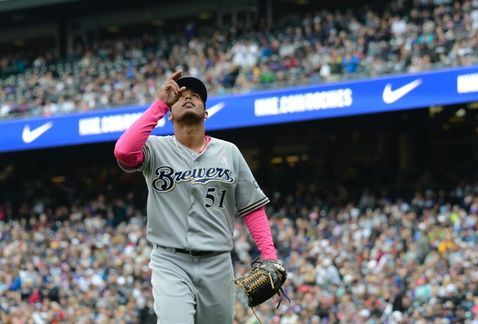 Does Freddy Peralta have a good changeup? Does Freddy Peralta have a changeup? Does Freddy Peralta have good control? Does Freddy Peralta have good command? Sure, he probably hides the ball well. Is Freddy Peralta effective at sequencing? No one is going to get even a decent understanding of pitcher-to-pitcher talent level by attempting to relate individual segments of pitching in this way. Let alone by making the above more granular, more internally contingent, more complex. We won’t even get useful/correct measures of “stuff” or “pitchability” from this endeavor. The tools Peralta brings to the table highlight why. In other words, for evaluative purposes, it’s legitimate to ask whether any of the above questions, individually, even matter at all, and to what end? We probably just have to let the batters tell us. Not the sum of the movement charts, radar guns, sequencing metrics, or mechanical tracking systems. Not because whatever is fueling Peralta is some mystical, magical dark power. But because whatever makes him so special is a slight, minute difference versus other pitchers (or more likely, the combination of several slight, minute differences) which are each mostly beneath our level of useful precision in capturing and then explicating with great fidelity. And great fidelity is indeed required to evaluate pitcher value, because the difference(s) between a #2 starter and a #4 starter, or the difference(s) between a #4 starter and a #6 starter, is ultimately very small and slight. Another way to phrase the above, re: upside: Who has more of it? It seems our classic definition is the guy who throws 97 with good secondary. Who needs to refine some things, and command some of the finer points of pitching. But what about a one-pitch pitcher with bad command and mediocre velo, who is already pretty good? What if he learns a second pitch? What if he learns 10% better command? What if he adds 2 MPH? Are those things any less in his grasp, and would they not vault him at least as much or more than the horse already throwing 97 with good movement? This is not to suggest that different pitchers don’t have different capacity to improve. But doesn’t this example suggest that the answer to that question is probably much more nuanced and complicated than the amount of credit we usually give it? And as a result, the “true” answers, if we could know them, would probably surprise us? And therefore, as a result, we’re probably better off tending towards extremely simple questions (perhaps, for example… how do taller pitchers develop compared to shorter pitchers?) rather than powering up the supercomputer and riding the rapidly-expanding complexity? And also, by implication… does it not follow that “upside” as it’s normally conceived far less of an ultimate virtue than we seem to consider it?